eReading for the End of the World! Thanks largely to the research expertise and practical skills of eBook meister and SEQUENCE co-editor Russell Pearce, our first array of eBook publications has just been launched — a central element in REFRAME and SEQUENCE’s particular model of academic ePublishing. 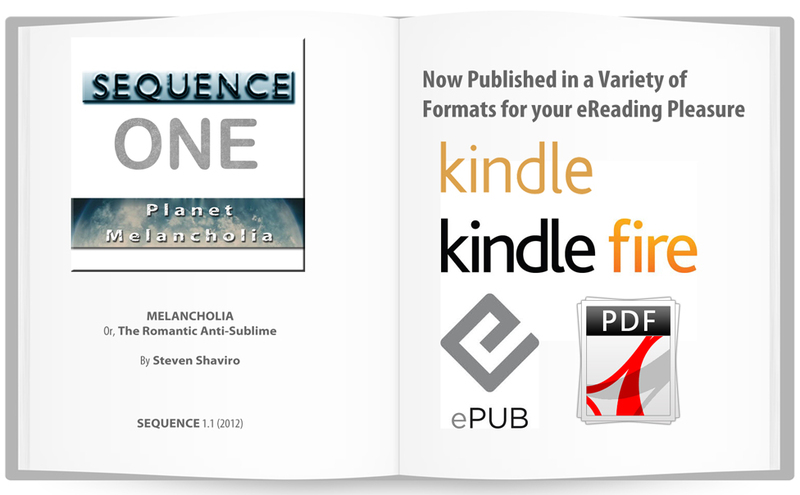 You can now read SEQUENCE 1.1 — Steven Shaviro’s magisterial and open access article about a film about the end of world (‘MELANCHOLIA, or, The Romantic Anti-Sublime‘) — in a variety of free eBook formats. Just click here to check them out and download them to your devices. At the very least, they’ll take your mind off the end of the world. Or, then again, maybe they won’t. This entry was posted in News by Catherine Grant. Bookmark the permalink.